So here is the book; the one that didn’t get to the party last weekend. 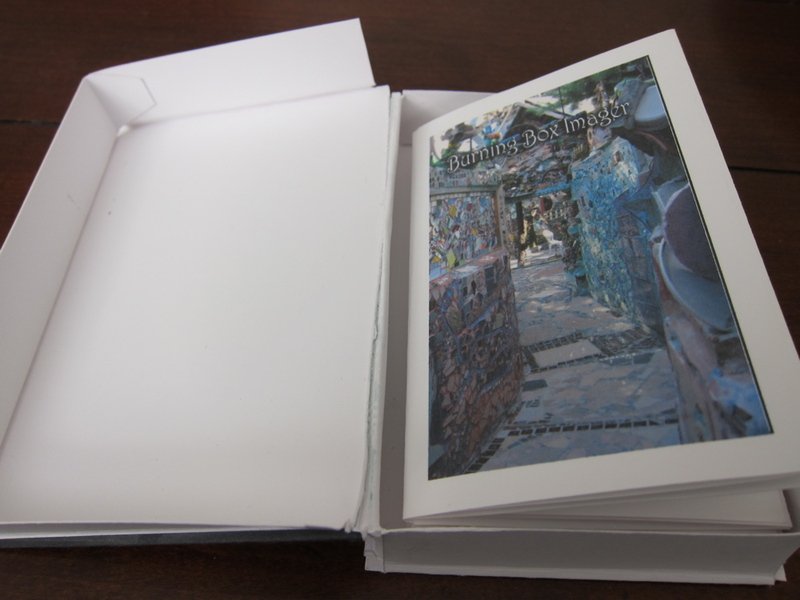 It is a box with three booklets inside. This is the third box I’ve made. Again, I’m not entirely happy with my craftsmanship, and may try one more time. The box is approximately 3×4.5 inches. Note the lip around the top and bottom of the box. I think it adds an elegant touch and probably adds strength. It is very difficult to create; two opposing folds 1/8 inch apart. The media distribution box named Burning Box Imager is now a box, again. 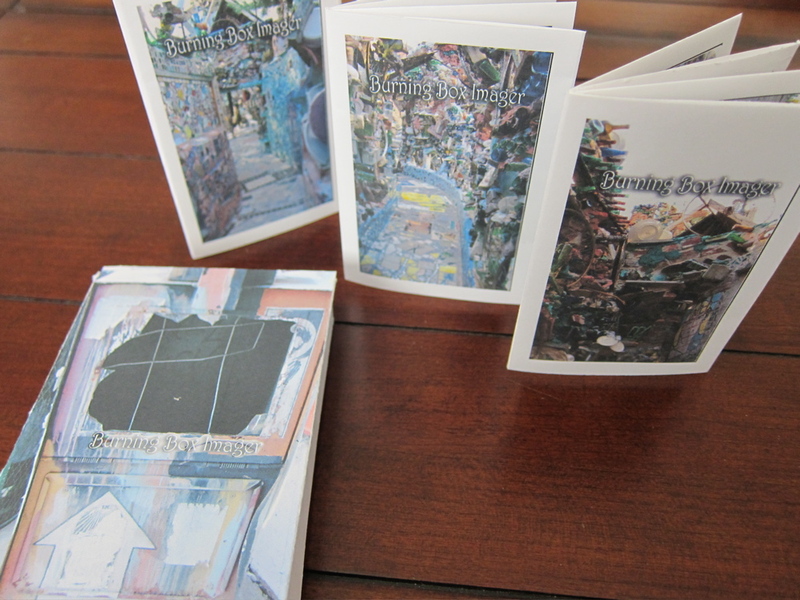 Inside are three different copies of the Burning Box Imager, my virtual newspaper. These papers are created from one sheet each. You can get directions here. I used pictures I took in Philadelphia at the Magic Garden, which is near the burned out media box; they remain linked in my mind. 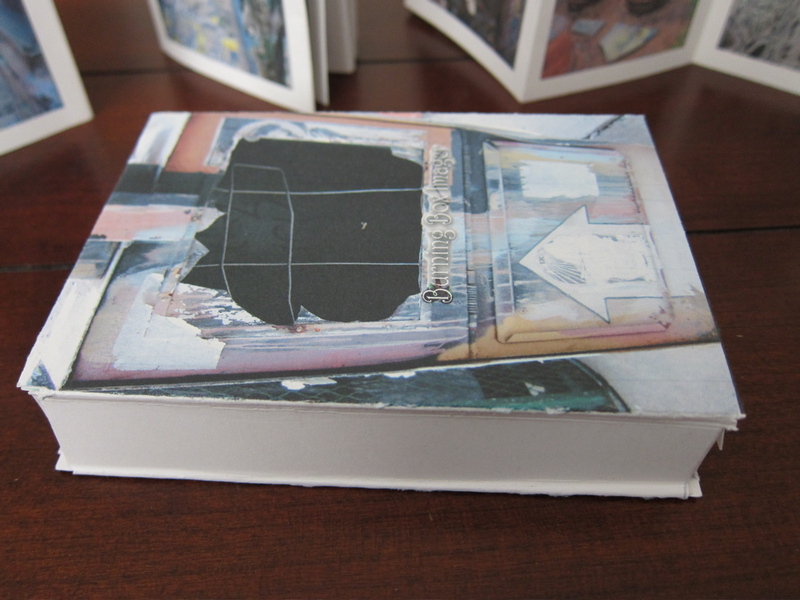 Here you can see the little booklets inside the box. 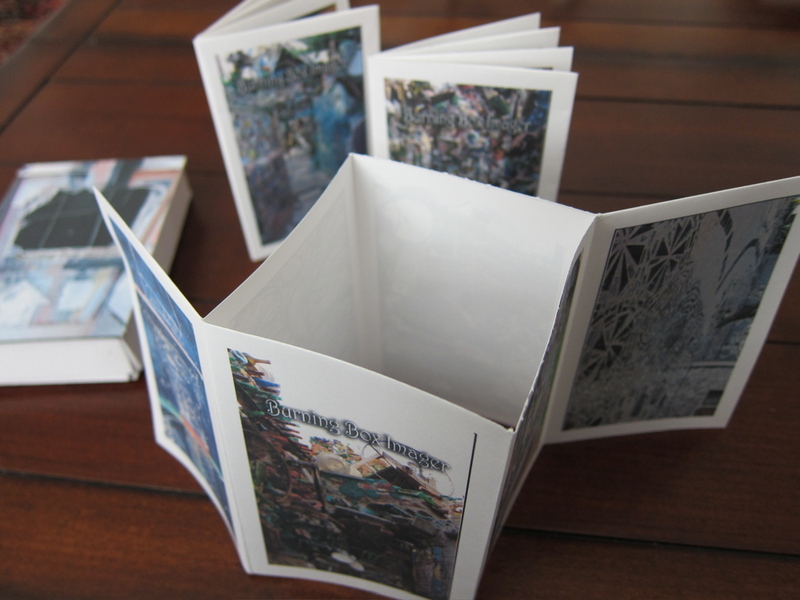 Each booklet has the title on it. This entry was posted in Artist's books by ruthek. Bookmark the permalink. I like the new site, Ruthe. Now, if I can just get my link to your blog fixed. For some reason, it insists on going to the old site no matter what I do. Grrrr. Found you and will bookmark you so I can get here again. Hope this place suits you. Your books sweep me away with the creativity and emagination you show building them. Bravo…. …now I am off to bookmark you. Spent sometime visiting with you 3 am when sleep was just not on the menu. Look forward to more of a give and take.